Here is our guide of what not to do when sending a vacancy to a recruitment agency in the hope of them finding you someone suitable. I appreciate from the outset that you may well be reading this thinking why would I want to instruct a recruitment agency anyway! 1.Do not send an email to twenty five recruitment agencies and cc. them all in to the same email. Do not address your email to Dear All, and if my name is Jonathan, please do not say “Hi Kevin”. We have heard it said that if you send a generic email to lots of recruitment agents, it makes them work all the more harder to recruit the right person for you. This is completely wrong. What actually happens is your email comes into the office; we read it, groan inwardly and then almost certainly ignore it unless we have anything better to do. We don’t want to work a vacancy with twenty four other recruitment agencies. The most desperate of the bunch will work the vacancy and the rest will have better things to do. The reason we do not want to compete with twenty four other recruitment agencies is because everyone has access to the same CV banks, the same job boards and you can virtually guarantee that even if we were to find someone on our system that other recruitment agencies didn’t have, then someone somewhere will have sourced the same CV at some point and sent it over to the firm in question. In my experience in recruitment we have never once successfully placed a candidate with a company where they have given us a list of recruitment agencies they are working with. 2.Do not include the words 'client following’ anywhere on your job description. Asking for a solicitor or lawyer with a following (i.e. their own clients) is like asking for a solicitor who is a qualified plumber and able to speak fluent Lithuanian whilst standing on her head. The vast majority of employers have restrictive covenants in place that expressly prohibit any member of staff from approaching clients and taking them with them to a new firm. There are a few here and there who have sources of work that they can tap into and loosely count as a following, but generally these do not exist. If you send us a vacancy asking for a conveyancing solicitor with lots of description, and then add ‘and a client following’ then the chances are you will not get much of a response. 3.Do not set us out a list of strict expectations for a vacancy where there are likely to only be one or two applications. Here is a quick example: a firm based in Swindon looking for a residential conveyancing solicitor on a full time basis, starting as soon as possible with specific experience of a certain case management system - no applications from anyone who has not. The problem with this is that there are lots of different case management systems and the chance of finding someone looking in Swindon at any particular time working on one particular type of these is very difficult indeed. Try to be as broad as possible to attract the candidate. After all, you can always reject unsuitable candidates but if you have restricted the field so much that you don’t get any candidates to reject, the whole exercise becomes a little bit pointless. 4.Do not send us a vacancy and underneath include the amount you are expecting to pay the agency to work for you. There are certain law firms out there who are notorious for doing this, and they tend to be based in the most difficult areas to recruit, and have the most outlandish expectations when it comes to sourcing staff. Why not wait and see what applications you get in before you start considering how much it is going to cost? 5.Don’t send rude emails. Recruitment consultants are mostly human and some of us even have a bit of pride in our work. I don’t particularly like working for clients who email us to say that we are a scourge on humanity but they are prepared to use us anyway. Recruitment consultants (or at least professional ones and not the type who act like estate agents) want to help you, because that is their job. If you send me a vacancy and don’t recruit one of our candidates I still take professional pride in dealing with you and also with the candidates who get details of your vacancy. Jonathan Fagan is Managing Director of Ten-Percent Legal Recruitment and a non-practising Solicitor. 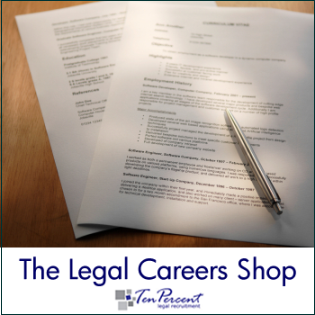 Ten-Percent Legal Recruitment provides online Legal Recruitment for Solicitors, Legal Executives, Fee Earners, Support Staff, Managers and Paralegals. Legal Practice Course - professional course or just a rip off?